Alterra Coffee Packets for Flavia Here! Alterra Coffee Packets | Flavia Coffee Packets Here! Not long ago, your Flavia coffee packets were changed and redesigned to bear the Alterra coffee name. While the Flavia coffee refills were delightful, the new Alterra flavors not only make it easier to read and understand the coffee flavor you're about to drink, but Alterra coffee flavors are just more fun! While the Flavia coffee refills may have been a little more colorful, Alterra's coffee packets feature the geographical place from which their flavors were inspired. Of course, the Alterra coffee packets contain other flavors as well, such as French Roast, House Blend, Hazelnut, Morning Roast, and Barista's Blend, just to name a few. 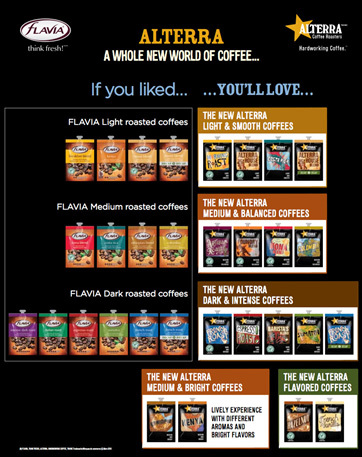 Just click this link to order more Alterra coffee refills. So, while the single-cup coffee brewers are still made by Flavia, just be aware that the coffee packets you receive from us will be Alterra coffee packets. Also, keep in mind that the Alterra coffee packets are designed the same way as the Flavia coffee refills, so there will nothing new to get used to, with regard to using your machine. For the latest news on Flavia and Alterra coffee, visit Jumpin' Joey's Flavia Coffee Blog, which features news, updates, and other fun stuff regarding all things Flavia and Alterra coffee. Also, if you need to contact us to order any new Alterra coffee packets or Alterra coffee refills, call Jerry at 504.272.7872 or fill out this.